Central Europe's rural landscapes are among some of the most beautiful places on Earth. Our Amish craftsmen have a close connection with their Dutch ancestors, and their respect and admiration for them find an outlet in every one of our handcrafted pine windmills, like this LuxCraft Dutch Garden Windmill. The Ohio wood shop that produces these lovely windmills is like all Amish towns in one respect: they live life as close to times past as they can, and everything they make is produced to a standard that doesn't exist anywhere else in the modern world. This LuxCraft windmill is handcrafted for your outdoor space with a focus on beauty, durability, and longevity. It is made of pressure treated kiln dried yellow pine that presents an affordable as well as a serviceable option for your outdoor decor. Use one of these wind mills to instantly give any outdoor space the sort of charm, simplicity, and calm that's only available in storybooks. Each wind mill ships with instructions for some minor assembly that it will require on arrival, and if you have any questions at all, please don't hesitate to give us a call - we'd love to hear from you. Keep the LuxCraft Dutch Garden Windmill in mind for the perfect housewarming or birthday gift. 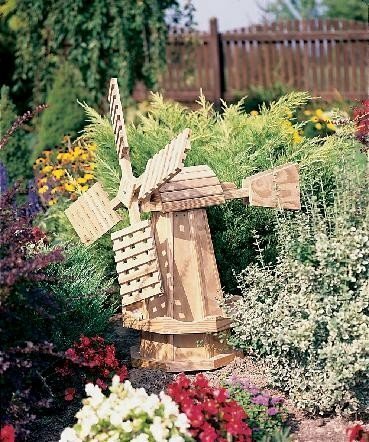 Grace your garden with this decorative Amish windmill and surround it with your favorite flowers. Be sure to review our complete line of Amish Outdoor Garden Decor to select what best reflects your personal style.